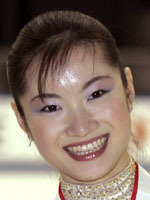 Shizuka Arakawa entered into Japanese sporting folklore at the Turin Games in 2006 when she became her country's first ever Olympic figure skating champion. She also won Japan's only medal at the Italian Games after a gold duck at Salt Lake following the impressive five golds Japan garnered at Nagano. Arakawa took the gold despite being something of an outsider when American Sasha Cohen and Russian veteran Irina Slutskaya, who were both tipped for the title, fell during their free programme. Perhaps it was her destiny when she also pulled off another coup by winning the 2004 world title from under the noses of established American Michelle Kwan and once again Cohen. Her amateur career up to Turin had been solid but unspectacular, but there was no denying a third world title for Japan in 2004 as Arakawa turned in a dazzling routine, emulating compatriots Midori Ito (1989) and Yuka Sato (1994). Her talent was already evident as a school girl, making triple jumps look as simple as riding a bike and she was Japan's undisputed junior champion between 1995 and 1997. An established performer, she took part in her first Olympic Games on home soil at Nagano in 1998. Sadly for Arakawa and her fans, the competition was too tough and she turned in a modest 13th place finish, well behind American teenager and gold medallist Tara Lipinski. The same year, she finished 22nd at her first world championships. Although she struggled for top results on the world stage, in Japan she racked up national titles in 1998 and 1999. The winds were changing however and her status as Japan's number one began to come under threat from emerging talent Fumie Suguri. She went through a four-year period when her appetite for international competition waned, taking a step back to simply enjoy growing up and enjoying her hobbies. However the Tokyo native began her comeback in earnest in 2002, skating to a career best 8th place at the world championships in Washington. It was then that she committed herself to reaching the top. In January 2004, just a few weeks ahead of the world championships, she split with her American coach Richard Callaghan and took up camp with Russian master Tatiana Tarasova, who had already groomed numerous champions including Cohen. The switch paid immediate dividends as she stood on the top podium in Dortmund following a routine which made her world champion. Then came the crowning moment in her career with the Olympic triumph in Italy before she decided to turn professional as well as combining her skating with commentary work for television.